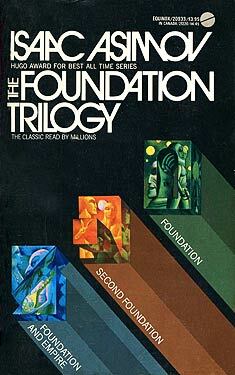 If you liked The Foundation Trilogy you might like these books. FOUNDATION begins a new chapter in the story of man's future. As the Old Empire crumbles into barbarism throughout the million worlds of the galaxy, Hari Seldon and his band of psychologists must create a new entity, the Foundation-dedicated to art, science, and technology-as the beginning of a new empire. FOUNDATION AND EMPIRE describes the mighty struggle for power amid the chaos of the stars in which man stands at the threshold of a new enlightened life which could easily be destroyed by the old forces of barbarism. SECOND FOUNDATION follows the Seldon Plan after the First Empire's defeat and describes its greatest threat-a dangerous mutant strain gone wild, which produces a mind capable of bending men's wills, directing their thoughts, reshaping their desires, and destroying the universe.